Acquired directly from the artist by Harry Torczyner in 1960. Art News, vol. 59, no. 4, summer 1960, p. 30 (illustrated). D. Adlow, review of "The Arts of Belgium 1920-1960," Christian Science Monitor, 23 July 1960, p. 8 (illustrated). J. Canaday, "Floating rocks and flaming tubas", Horizon, New York, vol. IV, no. 3, January 1962, p. 82 (illustrated in color, p. 85). P. Waldberg, Ren Magritte, Brussels, 1965, p. 90 (illustrated in color). Artforum, December 1965 (illustrated in color on the cover). H. Torczyner, Ren Magritte: signes et images, Paris, 1977, p. 110, no. 174 (illustrated in color). S. Gablik, Magritte, New York, 1985, pp. 110 and 202, no. 86 (illustrated in color, p. 92). P. Gimferrer, Magritte, Paris, 1986, pl. 113 (illustrated in color). "L'avocat aux vingt-cinq Magritte," Supplment Arts du Figaro Magazine, no. 476, 12 May 1989, p. X (illustrated in color). H. Torczyner, L'ami Magritte: correspondance et souvenirs, Antwerp, 1992, pp. 166, 234 (illustrated in black and white, p. 145; illustrated in color, p. 24). R.M. 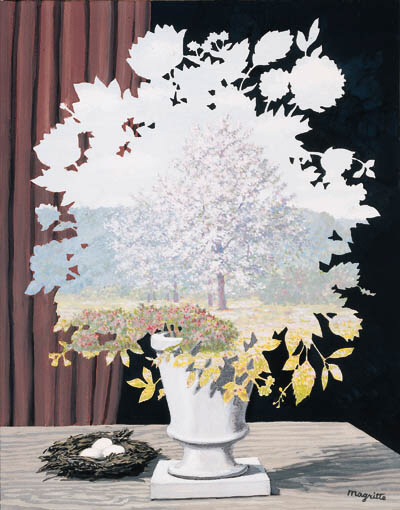 Jonger, Ren Magritte ou La pense image de l'invisible, Brussels, 1994, pp. 176, 222 and 257, fig. 34 (illustrated). R. Magritte, Magritte/Torczyner: Letters Between Friends, New York, 1994, p. 54 (illustrated). D. Sylvester, S. Whitfield and M. Raeburn, Ren Magritte, Catalogue Raisonn, London, 1994, vol. IV (Gouaches, Temperas, Watercolours and Papiers Colls 1918-1967), p. 227, no. 1481 (illustrated). New York, Parke-Bernet Galleries, Inc., The Arts of Belgium 1920-1960, June-August 1960, no. 56 (illustrated in color on the cover). New York, Albert Landry Galleries, Ren Magritte in New York Private Collections, October-November 1961, no. 9 (illustrated in color). Minneapolis, Walker Art Center, The Vision of Ren Magritte, September-October 1962, no. 18 (illustrated). New York, Sidney Janis Gallery, Magritte, December 1977, no. 31. Magritte first explored this image in an oil of 1940, and then again in 1942 (Sylvester, nos. 472 and 503; private collections); this gouache is the third version. The title was conceived in 1938 by Magritte's friend, the poet Marcel Marin, for another painting, La chane sans fin (Sylvester, no. 454; destroyed). However, when the artist heard the title he responded, "The title Plagiary is very strong and very fine. I am appropriating it" (quoted in D. Sylvester et al., op. cit., vol. II, p. 260). Magritte initially felt that the title was so penetrating that it would be suitable for all his pictures. However, two years later, he finally applied it specifically to the present image of the transparent bouquet. Images such as Le plagiat suggest a pictorial equivalent to ideas of simultaneous existence and multiple viewpoints. One is never quite sure whether the bouquet and the curtains behind it have become transparent--allowing the viewer to see behind them--or if possibly the garden exists simultaneously in some other 'interior' dimension. Certainly, this conceptual image is related to the poetic re-definition of the word 'garden' as "a space set between a landscape and a bunch of flowers," which Magritte and his friends devised in 1942 while playing a Surrealist game.